Summer is here again, and along with it, the local growing season. A time of year when the amount of sun is measured instead of rain; when people can be seen spending time outside, in the garden having a meal, or going for a walk. Sometimes in the summer I will overhear hobby gardeners trying to meet new people to give their zucchini to. I love to garden, yet I don’t grow many vegetables. I do well with garlic and potatoes, but usually I stick to perennial flowers and herbs. My agreement with plants is that I will do the best I can, but they must possess the will to survive. I know that some people have the skill of being able to grow food, and some not so much. I tend to leave the food growing to the professionals, our local farmers, and stick with gardening for aesthetics. This way I can support another person in the community at what they do well and have my own satisfying moments in the garden. Most people would agree that it’s a hard life being a farmer. In the Northwest, a big part of the challenge is the weather. Even though we have a nearly year-round growing season, the weather can wreak havoc on a professional farmer. A planting of carrots that gets infested due to moisture, or a freak warm spell in February that makes all the fruit trees bloom early, are just some of the unknown variables in a farmer’s life. Our local farmers are out in the weather that hobby gardeners often work to avoid. Organic farming has experienced a large boom in Washington State since the 1980’s. In 1988, there were sixty three certified organic farms in Washington, representing 2,000 acres. In 2005, there were 571 certified organic farms, occupying 60,759 acres. Today, there are 34 certified organic farms in Mason, Lewis, and Thurston County combined. At the Co-op we’ve had long standing relationships with a few local farms, like Rising River and Kirsop, who helped create the Local Buying Program at the Co-op. Stoney Plains and Helsing Farms were also early on the scene. There are farms that the Co-op has begun to cultivate relationships with over the past few years such as GRuB (Garden Raised Bounty), who sell flower bouquets and raspberries to the westside; Tolt Gardens who have earned the nickname “The Lettuce People” at farmers markets; as well as Hop To It, who grows tomatoes, berries, and peaches in greenhouses, and seems to be willing to accept any growing challenge. We may yet see avocados grown in Washington, in the greenhouses of Hop To It. When our local farmers are able to supply the Co-op with what they grow, we make it a priority to buy those items locally. We buy produce from our larger distributors, Organically Grown Company (OGC) or Charlie’s, only when we are not able to get the item locally, or the local supply is minimal. 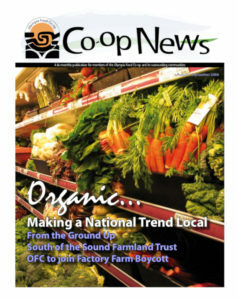 There isn’t a local produce buying program as detailed as that of the Olympia Food Co-op’s in the region, and farmers have sought out a market at the Co-op because of our reputation. Last year, we bought over $250,000 of local produce which makes the Olympia Food Co-op the largest buyer of produce direct from farms in the state of Washington. We, as produce managers, have wondered if we are reaching the point where we are dealing with as many farms as we are able to support significantly without spreading our buying power too thin. Most of the local farms that the Co-op buys from have organic certification. 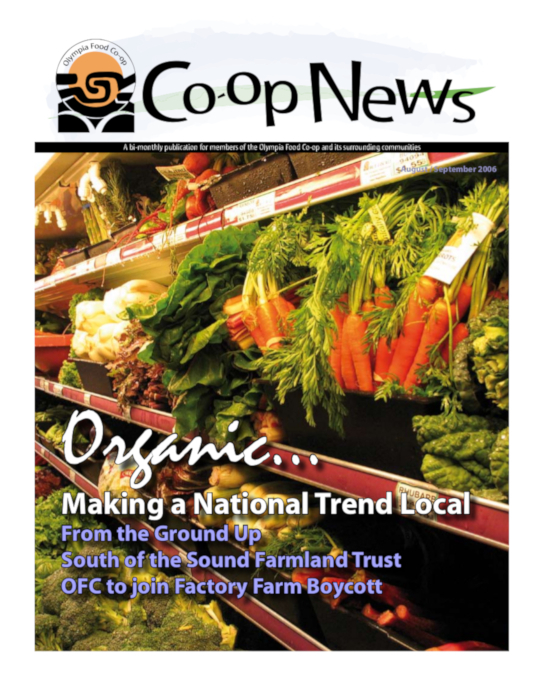 Within a growing season, the Co-op buys directly from about thirty farms and orchards. Of those thirty, there are only four or five farms that are not certified. These farms, referred to as pesticide free on signage at the stores, use organic practices but have not been inspected and certified. In some cases, the farms hold themselves to standards that are beyond organic certification requirements. Organic certification requirements include: an annual inspection of the farm by an authorized third party organic certifier; appropriate labeling; not using industrial equipment that has been used for anything other than organic agriculture, as well as providing public access to certification documents and laboratory analysis that pertains to certification. There are more things to consider about growing organically than not applying chemicals to fields or not using genetically modified seed. Methods such as crop rotation keep the soil from being depleted year after year of the same nutrients, as it does on monoculture farms which grow primarily one crop; or companion planting, where two crops are grown together that draw or provide complimentary nutrients to the soil, rather than competing for them. Organic agriculture is actually the historical world standard, and only in the past century has the world known anything other than organic agriculture. After World War II, farmers use of chemicals increased tenfold because they were sold on the idea of using chemicals to reduce their labor and increase production. Pesticides were sold to control bugs that would eat the crops, and herbicides were sold to prevent weeds from growing alongside what was being cultivated. As time passed, the bugs and weeds built a tolerance to these chemicals, so stronger chemicals were developed, over and over. Biodynamic agriculture is a method created and taught by Rudolph Steiner, conceiver of anthroposophy, in response to observations of decreased soil quality following the introduction of chemical fertilizers at the turn of the century in Europe. Steiner taught of celestial influences on plant growth, and how moon phases and subtle energy forces affect biological systems. Biodynamic agriculture views the farm as a living organism, striking a balance between physical and non-physical realms. Biodynamic agriculture was the first ecological farming method developed as an alternative to conventional (chemical) agriculture and has had a certifying process for farms since 1928 called Demeter. The organic trade is a rapidly growing industry (about 20% annually nationwide), as is evidenced by the increase in organic farms and the increase in Co-op sales. Organic is catching on, and as people are becoming increasingly aware of what they eat, they seem to be developing an awareness of how their food was grown or handled as well. For whatever reason, people are eating organic, and we should encourage them because it will benefit the land and our quality of air, soil, water, and life. So, as you grill the local corn, or make pesto salad with local basil and tomatoes, or try to find a new and interesting way to prepare zucchini, think about where your food is coming from. Was is something you were able to grow and harvest, or was it grown by our many professionals in the South Sound region? Organic is a state of mind, treating food the way we would like to be treated. Organic farming nurtures the land, our community, and makes you feel good about what you are eating. Whether you grow your own food, have an annual CSA share, or carefully select it from the produce rack to prepare it personally, there is still the experience of connecting with your food. These are all steps that are taken for a fulfilling meal that feeds more than your body. Eating is something we must do every day; it is what fuels our lives. Therefore, it’s best to make eating a pleasurable ritual. Another way to support local, organic food is to come to the Second Annual Harvest Party at Priest Point Park on September 17. The Harvest Party was conceived to bring the Co-op community together for food sharing and relationship building. One of the things we like to do is to acknowledge the local farmers and give them an opportunity to share information about their CSAs (Community Supported Agriculture) and other special activities that take place on their farms. Look for signs at the stores for more details.